"We request that no one take photographs or record tonight's performance. This show is for your memories." fat lot of good it did. the instant prince appeared on stage, the place lit up with people taking pictures on their mobiles and smuggled-in cameras. i can't say i didn't smuggle in my camera (or, for that matter, two rather sharp 4mm bamboo knitting needles, assorted sewing needles and a pair of scissors), but i didn't actually take pictures during the show. see, i've got principles. the second half was more recognizable for me, at least, and the last few people sitting got up and danced, until the entire arena was singing along and having fun. 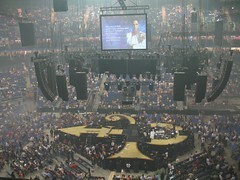 the energy was amazing, and it certainly looked like prince and his band were enjoying themselves, too. his band, incidentally, were terrific. he kept giving them solos and encouraging them by saying things like, "this is real music! this doesn't come out of a machine!" he was right. there was a lot of talent on that stage. two enthusiastic thumbs up. i downloaded the new CD, so prince goes back on my regular playlist for a while.